This was once part of the community of Rock Rest. There was a school and a Cumberland Presbyterian church by that name. 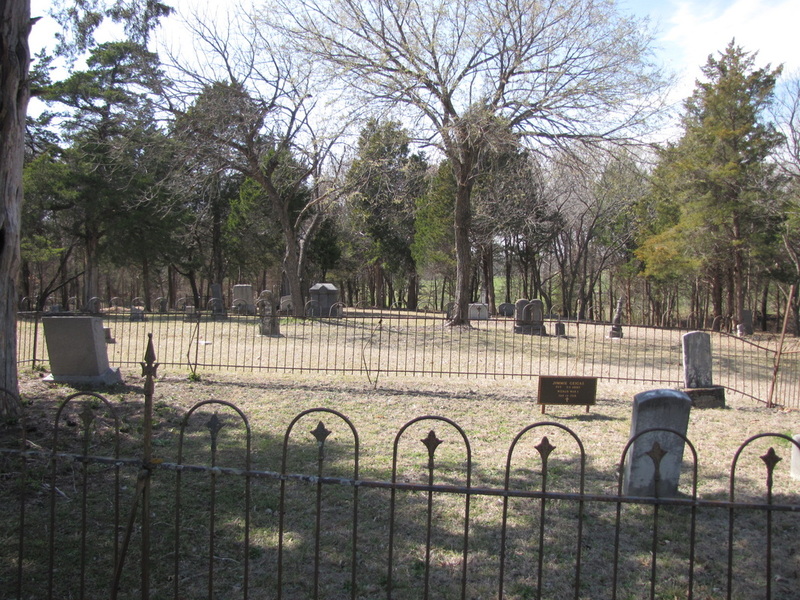 The cemetery is sometimes called Rock Rest after the community. Part of the cemetery was once the burial ground for the church. The area was also called Woodlawn. 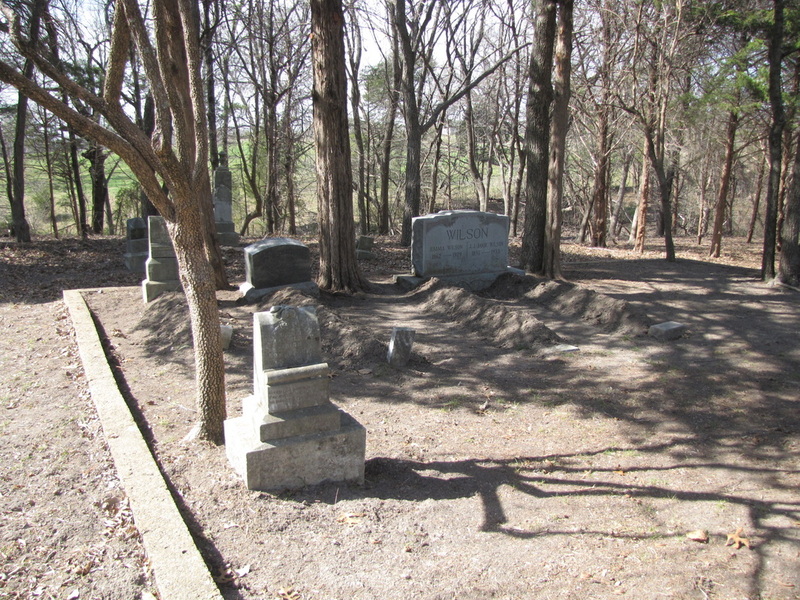 The Noyes family owned the land at one time, and said the name of the cemetery was Noyes Cemetery. However, the deeds for the cemetery, listed in Vol 16, p 403, and Vol. 17, p 565, state that the name of the cemetery shall be Woodlawn. The Lower Bonham Road, which was also called Woodlawn Road, went by the cemetery. This is one of the most beautiful cemeteries in the county with lovely trees and open grassy areas.. It covers about 4 ½ acres. There is a creek around 2 sides named Dripping Springs Creek. The graves tend to be in clusters under trees. There is a small area fenced with wrought-iron near the entrance with 3 or 4 graves. There is only one Noyes buried here - Anne Belle. Her grave is covered with concrete, and her name is crudely scratched onto the surface. The cemetery has a historical marker. It was dedicated in honor of someone buried in the cemetery, and is engraved on the back. The historical marker application says there are over 200 people buried here. COLLIN COUNTY CEMETERY INSCRIPTIONS I lists about 130. I do not know if the cemetery is active. The last burial I know of was in 1968. There is plenty of empty space. The driveway and road across the pasture are actually the cemetery access. The driveway for the farm house did not originally connect with the access road. The driveway for the house starts at the circular driveway At the time of my visits, the farmer had several large dogs that chased cars. The dogs did not follow the car all the way to the cemetery. Occasionally the farmer tries to cause a little trouble about allowing access. However, on all of my visits to the cemetery, I saw no one. The cemetery is very well maintained. There is supposed to be a cemetery association, but I do not think that it is active. The first Collin County soldier to die in World War I, Jimmie Geigas, is buried here. For his funeral, soldiers marched from McKinney to the cemetery following his coffin, about 5 miles. IN WORLD WAR I, ALSO IS BURIED HERE. LOIS HEAD AND BIRDIE MOORHEAD.